In honor of our grand victory, walking away from the 2014 Super GT Season as Season Champions - Goodsmile Racing & TeamUKYO is re-opening the 7,000JPY Level figma Course Personal Sponsorship to our international fans! To commemorate our achievement of taking back the throne this season, all figma Racing Miku 2014 Ver. will also include a miniature version of the Season Champion Trophy! And, if we win the final race at Motegi on Nov. 3, we'll include one more - for a total of 3 trophies! 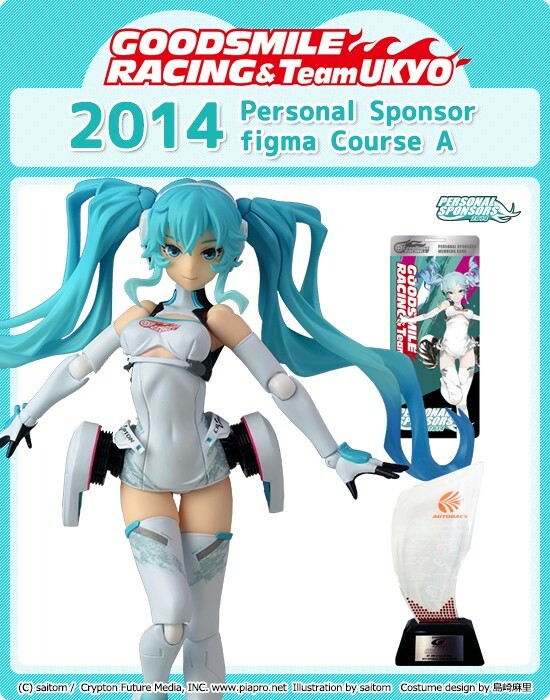 This trophy will be included with all figma Racing Miku 2014 Ver. Courses, regardless of when you completed your application! Registration will be open from (Thurs) Nov. 20 to (Mon) Dec. 1, 2014 at 10pm JST.